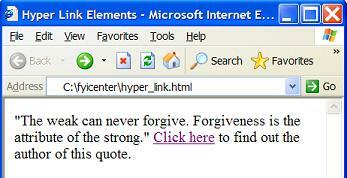 An "a" element with the "href" attribute defines a hyper link. The "href" attribute is used to specify a URL representing the linked resource. The content of the "a" element should not be empty. The content of the "a" element will be highlighted by most browsers to allow viewers to click the hyper link to retrieve the linked resource. <p>"The weak can never forgive. Forgiveness is the attribute of the strong."